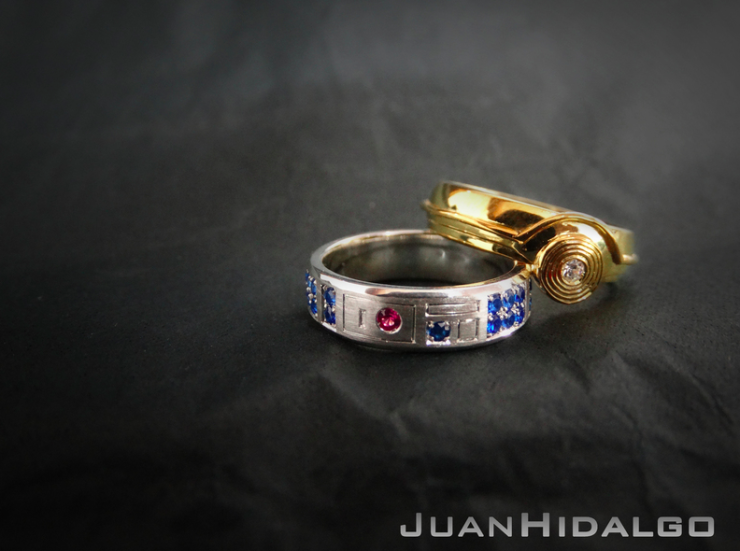 C-3PO And R2-D2 Wedding Bands For Star Wars Geeks | OhGizmo! These are a pair of nice-looking Star Wars themed wedding bands. One is made out to look like R2-D2 while the other C-3PO. Who wears which is entirely up to you of course, but if you’re enough of a geek, disagreement over this might just be enough to fuel endless arguments ultimately leading to your divorce… I mean, do you really want to give your wife the C-3PO ring, while keeping the obviously cooler R2-D2 for yourself? They’re the work of jeweller Juan Hidalgo, and we don’t know how much they cost.